Hello, hello! How was your leap day? Day 1 of my 30 day 30x30 Remix Challenge... this is so easy! so I guess the (self-imposed) challenge is already working! and please consider joining me and linking up too! 1 down, 29 to go! I (we) can do this! I just found your blog and love the lace detail with that necklace. It's a great combo and nice job on your remix challenge. Seems difficult but fun. Following you now! Yay I hope you do! I could use some other 30X30 remixers to cheer me along during the next month! Thank you! I hope you will stay tuned for the next 29 days! Great idea! I might have to try it out soon. Can I just say I love love love your outfit and that's coming from a girl who doesn't care to wear jeans. That necklace is simply stunning. You look great girl...lovely first look to start off the remix! That is one fabulous necklace - it looks stunning with that outfit! Great Day 1!! This such a great idea. I just don't know if I have the will power!! ;) Loving that necklace!! You are off to a great start! Love this look. it would look amazing on you! Take the plunge and do it with me! Kendi Everyday's site has wonderful encouragement for first time 30X30-ers! This look looks adorable on you! Love that lace top cant wait to see how you style it. I have one as well and barely wear it but I love it... strange I know. i love your bag. i'm checking out more on the 30x30 challenge - seems interesting. your lace top is adorable, and i love all the sun in these photos! I have been thinking about doing this! I need to stop shopping and this seems like a good way to do it, Kendi makes it look so easy. I love your necklace! I love this first look! I have a feeling your amazing accessories are what will really make your 30 outfits unique. 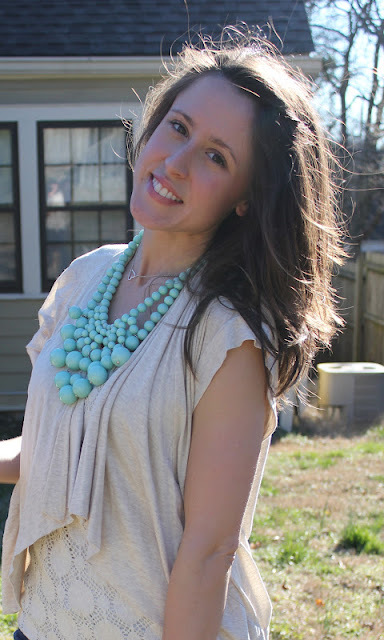 This statement necklace is so gorgeous, I am drooling!